Update: We have a follow up to this post. The January housing starts report is scheduled for release at 8:30 a.m. ET tomorrow. Economists expect housing starts to decline to a pace of 914,000 units. Millan Mulraine at TD Securities is looking for a print of 910,000 units because of the “cold snap across the country during the month.” He expects permit approvals however to rise to 920K. 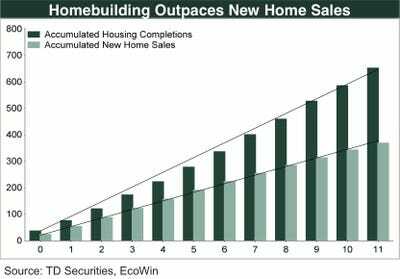 “New residential construction activity has been on a strong upswing, with the pace of housing starts surging to a new cycle high in December. While the rebound in building activity over the past year is largely consistent with the improved tone in housing market activity more generally, the 31% spike in construction since July appears to have gone slightly ahead of the market’s capacity to absorb it. This chart from TD Securities shows just why some experts are worried.